The Road to the Horizon: News: Indians want "more water, less Coca Cola!" For several years, Indians have been protesting against the presence of Coca Cola plants in their community. Yesterday 1500 villagers marched to the Coca-Cola company's bottling plant in Mehdiganj in Varanasi demanding that the bottling plant shut down immediately. They accuse the Coke Company of creating severe water shortages in the area and polluting the water and land. 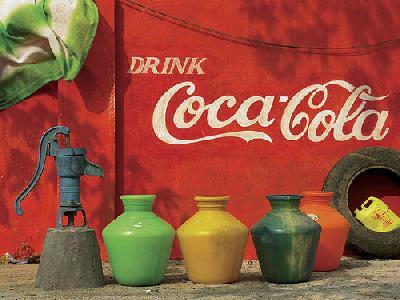 During a two-day conference on Right to Water a representative of the Uttar Pradesh State Pollution Control Board admitted the Coca-Cola bottling plant in Mehdiganj did not have a current hazardous waste authorization required to operate. Worse is that data collected by the Ground Water Board confirms ground water levels have dropped up to 8 meters (26 feet) in the first seven years of Coca-Cola's operations, from 1999 to 2006, leaving wells and hand water pumps dried up.